Living in Metro Vancouver during the winter months, we have to ensure we pick our moments and get outside when there is a glimpse of sunshine. 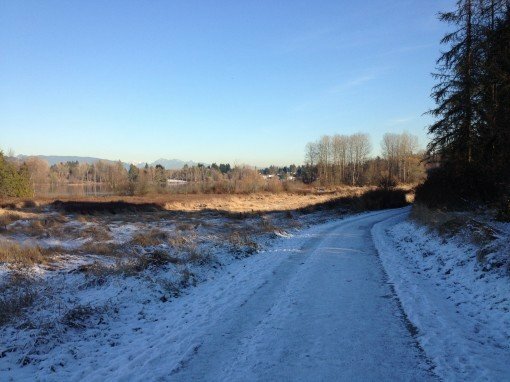 A walk around Deer Lake in Burnaby on a winter’s day can offer a wonderful break from a busy work schedule or Christmas shopping. It’s not often there’s snow around Deer Lake but when there is, an afternoon outing can be a special moment. The trail is an easy walk and the loop around the lake can be completed in about 45 minutes at a brisk pace. The walk can be extended by following trails further to the west that loop around an open field area before return back towards the lake. The route is also popular for trail running as it is snow-free most of the year. Dogs are allowed on the trails but not in beach or picnic areas and they must be on a leash at all times. There are usually plenty of ducks, geese, and other birds who use the beach area so dog owners should keep their dogs away from this area to not disturb the wildlife. It’s best to start from the east side of the lake where there is a large parking lot off of Sperling Avenue, just south of Canada Way and the Burnaby Village Museum. From here, you can choose which direction but I always prefer to do a counter-clockwise route. Just beyond the swings, walk onto the wooden boardwalks and follow the trail while enjoying the views of Deer Lake. Be careful on the boardwalks during the winter as they can sometimes be a bit slippery when they are covered with snow or even wet. Most of the wooden boardwalks have been covered with some chicken wire and other material to help give you grip. I’ve found these to be quite effective and most times walking on them when there is a bit of snow is not a problem. One time, however, the boardwalks were covered with a sheet of ice, which made for a very slippery walk. The trail is easy to follow and there are several maps throughout the park. There are a few portions where the trail reaches a road; the first is near the beginning of the walk where you simply go left, walk across the bridge, then resume your walk on the gravel trail to the left. The second is when the trail heads away from the lake and passes a house before arriving at a road. Simply go left and walk down this quiet road to the bottom where the trail will resume. The final road section is on the other side of the lake where the trail comes up to a narrow road where there are several house on the side of the hill. Follow this road until you reach a map, then go left onto the gravel trail, which will return you to the parking lot where you began. Deer Lake is a great place for a quick walk year-round but if you can time it right during the winter months when the sun is shining and there’s a bit of snow on the ground, your outing will be that much more special. Hi Michael! Thanks for the great recommendation. We were stumped where to walk with Harlee this afternoon and your post was the perfect solution. Happy New Year! Glad you enjoyed it! Harlee might also enjoy the Capilano Canyon area (http://www.vancouvertrails.com/trails/capilano-canyon/). Park at and cross Cleveland Dam, then you can hike around the trails, cross back over the pipe bridge, come up the trail by the hatchery back to the dam to make a nice loop out of it. Best wishes to you guys too for 2015!